One critical bit missing for OptaPlanner is a web application to define an optimization problem in a web UI and to deploy it to the cloud. Drools and jBPM both already have such a web application: Drools Workbench and jBPM Workbench. 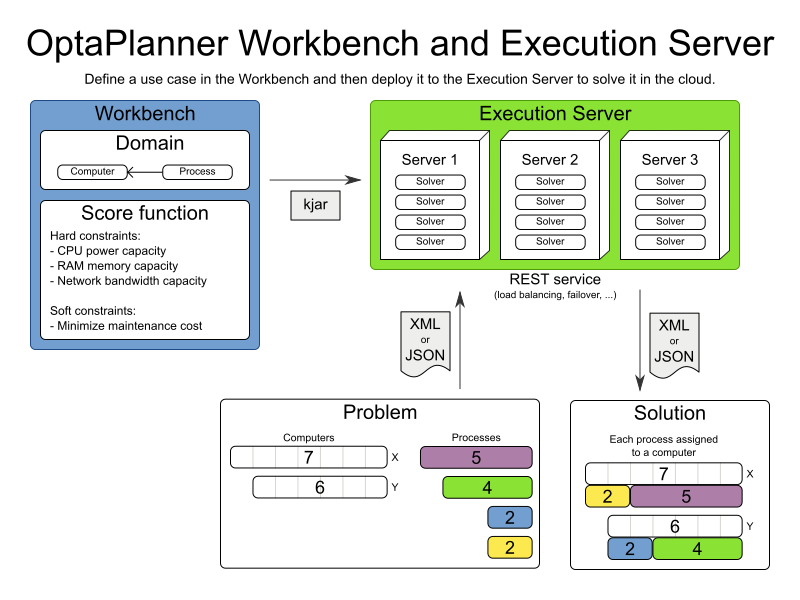 So it’s no big surprise that the OptaPlanner version of this will be called OptaPlanner Workbench. On the side line, we’ve build a quick prototype to investigate what OptaPlanner Workbench could do (thanks Walter, Toni and Michael). Let’s take a sneak peek at that. The Process data object is special because its computer field changes during planning, so we annotate that computer field as a planning variable. 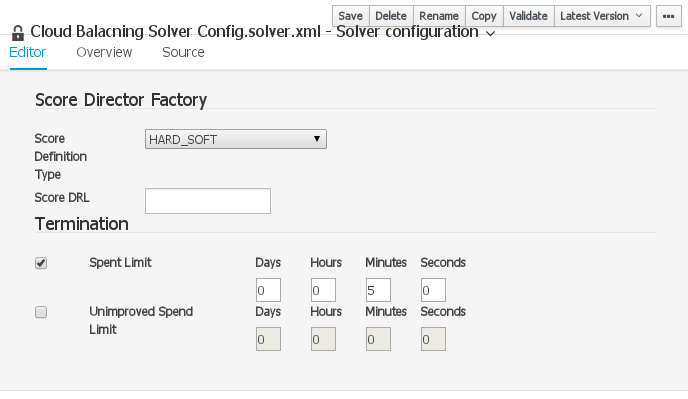 In the Solver Configuration Editor we can pick the Score type and define how long to solve. In the future, we would add support for all termination types, optimization algorithm tweaking and far more. When a client sends a problem to this REST service as XML or JSON, then the Execution Server solves it on one of its servers and returns the solution to the client. OptaPlanner Workbench is built on top of the OptaPlanner engine, but it will not replace it, nor curtail it: You’ll still be able to embed the OptaPlanner engine as before, without the Workbench, if you so desire. But the Workbench will offer new opportunities for many use cases. We’re still looking into how and when we’ll fracture the Workbench development into our schedule, but in time, the OptaPlanner Workbench will offer a business user friendly web interface to define an optimization problem. It will be part of the KIE Workbench (also known as Business Central) and seamlessly integrate with Drools and jBPM.